“KILLING KENNEDY”--Each of the most recent Christmases I’ve received a copy of two books written by newsman Bill O’Reilly: Killing Lincoln and Killing Kennedy. Family has long gifted me books on the murder of the 35th President knowing I’ll read these books word for word. Reason is, like so many around the world, I believe JFK was murdered by a treacherous and uncompromising individuals within a murky shadow government, which exists to this day. But like a hapless prosecutor, who knows the guilty parties, but must watch helpless as they remain free because no proof beyond a shadow of a doubt is uncovered to obtain a conviction, most of us shut up. We have no proof but we also do not categorically state that no proof exists. 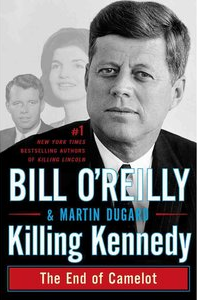 As for the Killing series, O’Reilly and co-writer Martin Dugard have cobbled two very well crafted works of non-fiction. Their research is first rate, well documented and the stories retell two American tragedies in direct and easy flowing language. As authors they have earned their laurels. 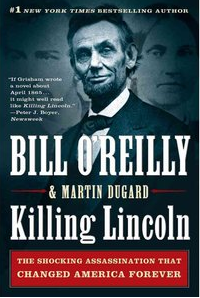 And, if history can be entertaining, O’Reilly and Dugard have succeeded. Like so many other readers, I found Killing Lincoln fascinating and informative. “…There are still Americans who believe Lee Harvey Oswald did not act alone in killing John F. Kennedy. Some came to this belief thanks to Oswald’s comments and J.Edgar Hoover’s insistence that there was a conspiracy. Even Bobby Kennedy believed that Oswald did not act alone. The last line demands a “Why?” Why does O’Reilly believe the world will never know the answer to whether or not others played a role in the President’s murder? If O’Reilly believes there was no conspiracy then his answer is easy. There was no conspiracy because there was none. But still it would be worth a couple of pages in his book to point out what convinced him. If history proves O’Reilly is correct then his work is a service to this nation. If someday a conspiracy smoking gun surfaces and undisputed facts arise that proves once and for all that Lee Harvey Oswald was indeed “a patsy,” then the book is simply towing the company line of accepted history to date. Where will damning conspiracy evidence be found? The answer lies in currently sealed records. When those records are to the public they may uncover a written or recorded “will” to history made by one or more of the guilty parties. Until those discoveries are made the truth awaits…temporarily. Maybe technologies of the future will be able to decode erased tapes after all there are no statutes of limitations on first degree homicide cases. What a marvelous command of the obvious.